Part of the 100 acre KLCC development and positioned next to the famous Malaysian landmark – the Petronas Twin Towers – Mandarin Oriental (MO) Kuala Lumpur features 643 luxury guest rooms, suites and serviced apartments over 30 levels. Architecturally designed by WATG in association with GDP and interiors by HBA, this urban resort in the heart of Kuala Lumpur opened nearly two decades ago in October 1998. You know MO KL stands for luxury even before stepping foot inside from the rows of luxury and exotic cars parked at its door, Lamborgihini, Ferrari, Bentley to Rolls Royce. Going in, you’re greeted by a renovated lobby (mid-late 2013) by interior specialists DESIGNWILKES. Staying true to the original design brief and in line with the MO concept, a residential feel with a balance of sophistication and regional influence has been kept, including six 5m tall handcrafted pewter columns by Royal Selangor. The lobby certainly has finesse but it can get crowded due to the the hotel’s popularity. Not a concern for Club/Suite Guests as there’s a dedicated check-in at the Club Lounge on the 24th floor. The MO Club operated by a team of dedicated staff offers panoramic views of Kuala Lumpur, including the stunning Petronas Twin Towers through its floor to ceiling windows. The styling from the lobby extends to the MO Club making it homely yet grand, but what makes the Club really special is their attentive staff who go out of their way to make your stay comfortable. I jumped out of the limo in excitement on arrival at MO and didn’t realise I’d left my phone on it until we were half way through check-in. Fortunately the Club staff stepped in straight away and offered to track my phone down (Btw I didn’t use the hotel limo). Half way through our afternoon tea at the Club (the Club also serves buffet breakfast, Deli lunch and evening cocktails), they safely delivered my spanking new phone back to me with a wonderful smile. Obviously I was very grateful to have my phone (and more importantly the photos I’d taken on a recent trip) back and was very impressed by their service. Another fantastic benefit for Club guests is laundry, pressing and dry-cleaning for up to five pieces of garments per day (non-accumulative) which we found extremely convenient and practical. Generally speaking the food selection at the Club was better than many Executive Lounges but a la carte (e.g. offered at MO Singapore and Ritz Carlton Kuala Lumpur) is always better than buffet. There’s plenty of plush comfortable seating around the lounge but those by the window are taken up fast! As for the accommodation, we stayed in a Club Deluxe King Room which offers 40 square metres of comfortable living, worthy of a five-star badge. Considering the age of the hotel, the rooms are kept immaculately (house-keeping does a brilliant job) but signs of aging is hard to hide. Fortunately, staged renovation for guestrooms are planned towards the end of 2015. Despite it being an older style bathroom, everything was in the right place and very practical. Importantly, hot water was hot and the shower pressure was strong (it surprises me how many hotels gets this wrong). I did find it odd that MO KL had procured “Senses” toiletry though. Personally I’ve never heard of the brand and when most luxury hotels are impressing with big names like Ferragamo, Asprey and Bvlgari, it was somewhat of a let down. Not to say the product itself was bad…well, it just wasn’t branded. Superficial perhaps, but little things count when competition is fierce. Of all facilities, the Spa/Sauna is in the most desparate need of a total renovation, and the gym is looking a bit tired too. The Infinity Pool however is still in good condition and has a fantastic outlook into Kuala Lumpur. The great news though is all of these facilities are under renovation and will be closed till June 2015. In the mean time, the hotel has arranged interim solutions to minimise disruption. An abundance of restaurants and shops are within a stone’s throw and there’s even direct access to the Suria KLCC from the hotel which offers six levels of retail therapy and over 320 specialty shops. If you get bored, there’s a mostly air-conditioned sky bridge that takes you over to Pavilion over at Bukit Bintang which has another 500+ shops in just a 10-15 mins stroll. And if you over-shopped like us, there’s plenty of luggage shops to choose from. 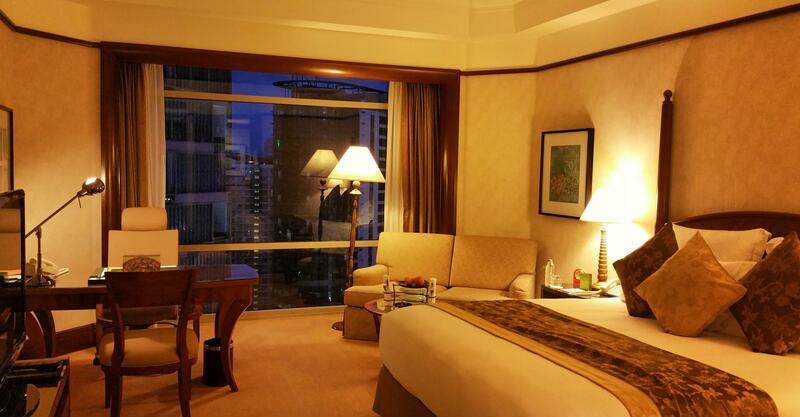 Overall service is impeccable at MO KL and it’s undoubtedly one of the top addresses to stay in Kuala Lumpur. The refurbishment over the near term is exciting for the hotel as it secures itself well into the future before the arrival of newer nearby luxury hotels in the pipeline, including St Regis (opening Nov 15), Banyan Tree Signature’s Pavilion (ETA end of 2016), Four Seasons Place (ETA 2017) and the world’s first Harrods Hotel (seven-stars) in 2018. Until these new hotels come online, my recommendation is if you want to be next to KLCC, stay at MO (Club floor if you can); and if you prefer being closer to Bukit Bintang, stay at The Ritz Carlton.